South Africa’s GDP was disappointing. The country’s economy sharply contracted by an annualized 1.2% in the first quarter, compared with the previous three months when it expanded by 0.4%, according to the statistics office. 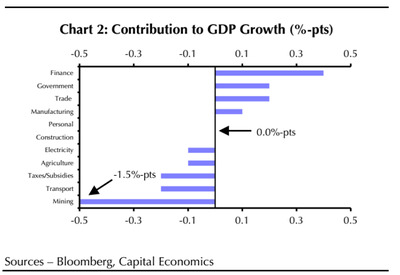 Economists were only expecting a contraction of 0.1%, according to the Bloomberg consensus. “South Africa’s ailing economy is clearly heading in the wrong direction,” wrote Capital Economics’ Africa Economist John Ashbourne. “We had always argued that 2016 would be a very difficult year for South Africa. It now appears that even we may have underestimated the severity of the country’s economic problems,” he added. 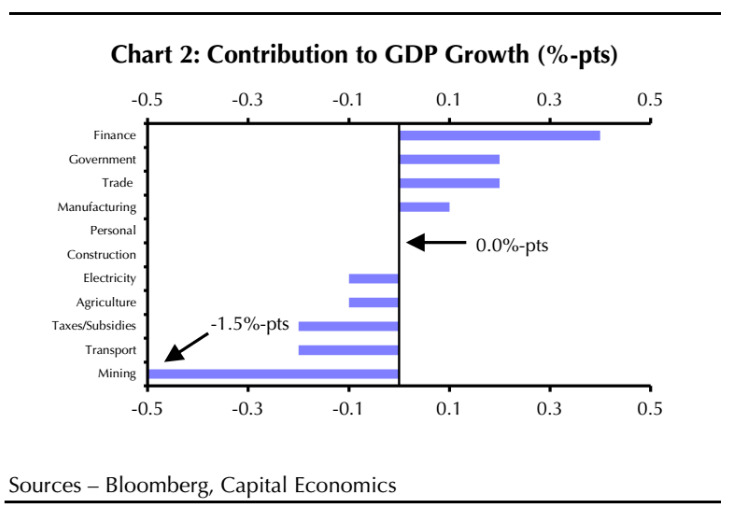 A huge chunk of the contraction came from the mining sector, which shaved 1.5% points off of the headline GDP growth figure. But, agriculture output shrank as well, and manufacturing just barely managed to squeak by. hit a 12-year high of 26.7% in the first quarter of 2016. May’s data also showed that the “expanded” unemployment rate, which includes people who stopped looking for work, also ticked up. It came in at 36.3%, above the previous quarter’s 33.8%. That rate was even worse in some rural regions, exceeding 50% in one area. And, as a subset of that, South Africa also has huge youth unemployment problem. The International Labour Organisation (ILO) estimates that the country saw a youth unemployment rate of 52.9% in 2014 — which is particularly noteworthy given that a whopping 46.95% the population is under the age of 24. “South Africa’s high rate of [total] unemployment is largely due to a combination of the structural legacies of the country’s Apartheid period and very poor educational outcomes, which leave many young people unprepared for the labour market,” Ashbourne noted back in May. Ultimately, all of this presents a huge problem for the government, which is hoping to keep its investment grade credit rating. The S&P held South Africa’s rating one notch above junk last week, and Fitch affirmed its rating at BBB- on Tuesday. However, Ashbourne expects that the “credit rating will be cut eventually” given all the recent developments. “…there is little optimism that things will turn around anytime soon,” Ashbourne concluded.